If you haven’t noticed, being healthy and well is in vogue right now. Which is why, an entire industry has sprouted off around an idea that should have been routine in the first place. Today, we have businesses ranging from health supplements, custom-cooked food catering as per your body requirements and tech innovations which are designed to provide users with data that helps them in improving their health. One of the most commonly used and accessible technologies is wearable tech, that includes fitness bands. Honor has been in this biz for a while now and recently introduced the Honor Band 4 Running Edition. The fitness band, which has been designed especially for runners, landed in our office a couple of weeks ago and after using it extensively, here are my two cents. The Honor Band 4 Running Edition is a funky-looking wearable with a two-tone TPU strap, which has a clasp buckle. The perforated strap helps drain out the sweat while working out. However, that being said, the design of the Honor Band 4 Running Edition is pretty generic. One good thing is that the tracker weighs just 17gms, which means you won’t realise it’s there while wearing it. Like most other budget fitness trackers, the main component of the Honor Band 4 Running Edition is the core, which can be worn either on the wrist or on your shoe using the special buckle provided with the band. While wearing on the wrist, the Honor Band 4 Running Edition performs just like any other fitness tracker. However, the running part comes to the fore when it’s worn on the shoe. The core is designed to detect the land impact and touch time of your foot to the ground to help reduce injury chances and improve your form. The Honor Band 4 Running Edition is water resistant up to 5ATM, which means it can survive in water up to 50 meters. I took a shower with the band on and its still on my wrist at the time of writing the review, so the claim holds true. For charging, you will find a two-pin contact at the bottom edge when you take the core out of the strap. Honor has provided a tiny charging cradle for the fitness tracker, which can be directly plugged into a USB port or a wall charger. However, the charger itself is very tiny and can easily be misplaced if you are not careful. Lest I forget, there is nothing on the back of the core, which means no heart rate monitor. This is a dealbreaker for fitness purists. The display on the Honor Band 4 Running Edition is a 0.5-inch, monochrome OLED screen. Ironically, for a fitness band that is mostly meant to be used outdoors, the display is barely legible in the direct sunlight defeating the whole purpose. There is a circular capacitive button below the display, which allows users to wake up the band and navigate between menu elements and requires only a gentle tap. However, there is not much to see on the band except the time, steps, distance, sleep time, and calories burnt. Detailed and elaborate information can be viewed on the accompanying app on your smartphone. Speaking of the accompanying app, the Honor Band 4 Running Edition works in tandem with Huawei Health app, which can be downloaded from the Play Store or Apple’s App Store. The app can also be downloaded by scanning the QR code on the packaging of the fitness band. 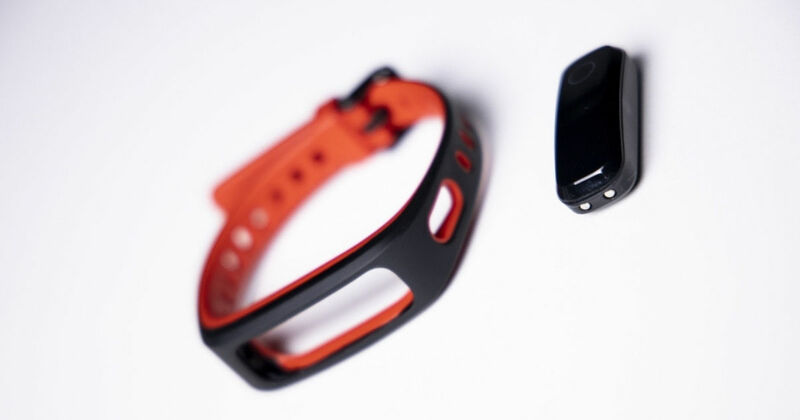 The wearable uses Bluetooth 4.2 LE to connect to your smartphone and is consistent in its connectivity. Once you have set up the app by providing your vital stats, the band connects to your phone over Bluetooth and starts syncing. Speaking of the app, the interface is pretty straight forward with three tabs – home, exercise and me. The home section shows the number of steps, calories burned and distance walked on the top. Apart from that, exercise records, sleep record, daily average steps and goal status are shown on the main screen. Pretty much everything you need to know is shown as soon as you open the app, which is great. The exercise tab has various modes like Run, Walk, Cycle and Train. The last option allows users to follow various training plans like 5km training plan, 10km training plan, half marathon training plan, and marathon training plan. The last section lets you customise the band to your preferences. You can set activity reminders, alarms, do not disturb mode, notifications, raise to wake screen and more options from here. One grievance I had with the Honor Band 4 Running Edition is related to notifications. While the band gets props for including all app notifications from your smartphone, the implementation of the same could have been better. Except for call and standard text messages, all other notifications are shown as an ‘i’ inside of a circle. Therefore, there is no way to know which app is sending you the notification, which is annoying at times. Additionally, there is no preview for the notification and no way to interact with them as well, which basically renders the notifications feature useless. In my experience with the Honor Band 4 Running Edition, the inactivity reminders and alarms were also iffy. Let’s get down to the brass tacks now, shall we? When it comes to actually tracking steps and runs, the Honor Band 4 Running Edition is pretty spot on. During my day-to-day routine, the fitness band was able to track the number of steps quite accurately, with hardly any errors (read ghost steps). The band was also able to track my run of 2 km almost accurately, as it showed the distance to be 1.8kms. But that slim margin of error can be attributed to my huffing and puffing along the way. Speaking of errors, the lack of a heart rate monitor takes away the ability to gauge the intensity of your workout and modify the routine. I also put the sleep tracker of the band through its paces and have no complaints on that front. The band was able to track my sleep timing down to the exact minute and also told me how many hours I was in a deep sleep and how many hours I spent tossing and turning. Apparently, I need to work on my sleep and that would explain the fatigue I feel when I wake up in the morning. But enough about my sleeping habits, let’s move on to the battery life of the Honor Band 4 Running Edition. Honor claims that the Band 4 Running Edition can last 21 days on a full charge and up to two weeks with regular usage. I have been using the fitness band for a week and a half now, and the battery is still at solid 30 percent as indicated by the Huawei Health app. Mind you, this was when I have had all features of the band turned on including the notifications and if you see the number of WhatsApp groups that I am part of, you will know the band was practically vibrating every other minute. Taking this into consideration, Honor’s claim regarding battery life certainly holds water. Let’s cut to the chase, the Honor Band 4 Running Edition is meant only and only for runners. And for its asking price of Rs 1,599, I didn’t really have high hopes from it, to begin with. However, if you are a runner, this is a good choice and for professional runners, this can be a good cheap alternative to high-end fitness trackers. From training plans to improving your form while running, the Honor Band 4 Running Edition has been designed for sprinting. But the lack of the heart rate monitor is a serious chink in the armour of Honor Band 4 Running Edition, which cannot be overlooked. If you are looking for a better alternative, the Xiaomi Mi Band 3 (review) is the way to go. For a slightly higher price of Rs 1,999, you will get a heart rate monitor, a much bigger display with touchscreen support and a more refined app.